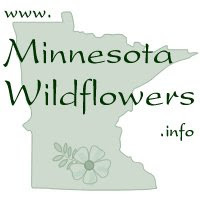 As a follow up to my posting about the native vines in our yard, there are a few other native vines that are common locally in Central Minnesota worth discussing. 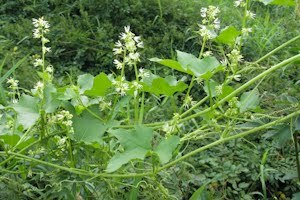 The first one is the Wild Cucumber Vine ~ Echinocystis lobata. I most often see Cucumber Vine growing along the margins of wetlands or low lying areas that are moist in full to part sun. 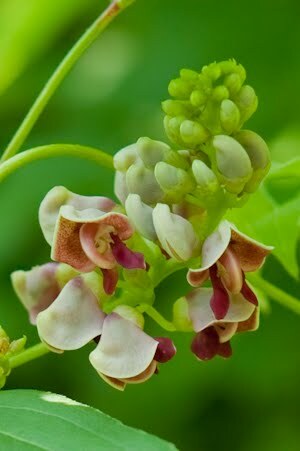 This annual vine can grow around 20 feet in length in one season, often scrambling over shrubs and tall forbs in a somewhat horizontal fashion. 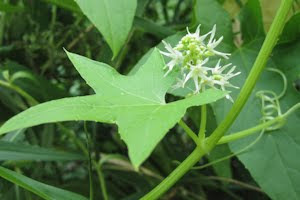 The flowers are star-like (6 petaled) and white arranged in vertical spikes along the vine stem. The leaves are palmate in shape. This vine has very long tight corkscrew (telephone cord like) tendrils enabling it to easily latch onto other plants for support. Cucumber Vine flowers from July through September. The spikey green bladder fruit develops in August and hangs below the vine. 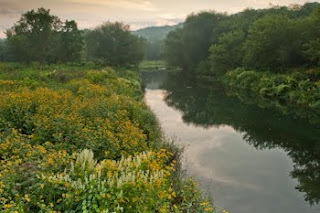 Here is Cucumber Vine growing alongside a stream at Forestville State Park in Southern Minnesota (white flowers in foreground). 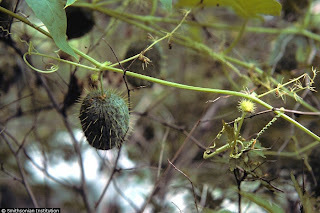 Cucumber Vine seed is available for sale from Prairie Moon Nursery. 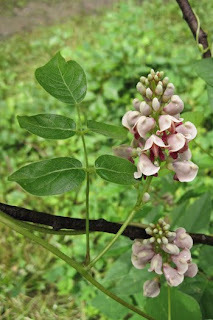 The other vine which I just recently discovered locally is Ground Nut ~ Apios americana. 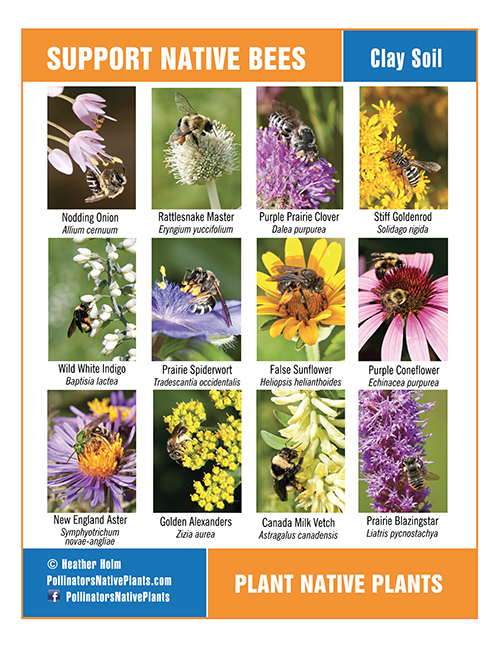 Other common names include Indian Potato, Wild Bean, American Wild Potato, Hopniss and Dakota Peas (and many more). This perennial twining vine has alternate leaves composed of 5-9 leaflets. The flowers can be light pink to a dark maroon in color resembling an irregular pea flower. 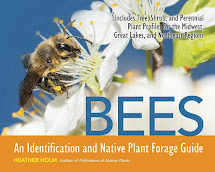 According to Fernald & Kinsey in Edible Wild Plants of Eastern North America this plant was introduced in Europe in 1845 "as a possible substitute for the potato, which was becoming subject to diseases". This was soon abandoned because the "plant proved to be an impracticable crop".